This is a full set of 2-inch UK size red and yellow pool balls! These pool balls are made of an homogeneous material. Designed with a perfectly central mass, they provide a perfect ball roll every time. 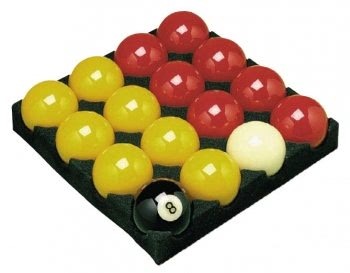 This is the perfect starter pool ball set, designed for use with 6ft & 7ft British tables! A set of 14 x Red and Yellow balls, a black ball and a white 2 inch cue ball. Ball materials give an excellent ball roll. Can be used with any 6ft or 7ft UK freeplay pool table. Recommended for use with domestic freeplay tables - not suitable for use with coin operated tables. Good value set of pool balls. Brought these to replace a set I got with my pool table a year ago - these seem to be of much higher quality.